It'll help soldiers carry all their gear. 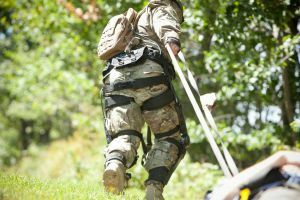 If the U.S. Army has its way, the soldiers of the future will use powered exoskeletons to carry heavier loads on the battlefield without getting tired. That’s according to a new story in Reuters about the military’s $6.9 million contract with Lockheed Martin to develop ONYX, an exoskeleton suit that straps on over the wearer’s clothes — instantly turning them into a “super-soldier,” if the tech pans out. Lockheed is licensing ONYX from B-TEMIA, a Canadian company that developed the technology to help people with multiple sclerosis and osteoarthritis move around. But the Pentagon realized the same tech could help its soldiers lug around all the armor, weapons, and special equipment they need in the field — a load that can total more than a hundred pounds per fighter. The history of the military and industries are littered with aspirational exoskeletons that never amounted to much. The technology is challenging because it needs to be responsive, reliable, and, above all, safe. But next-generation actuators, sensors, and artificial intelligence systems are heating up the exoskeleton race — Reuters reports that the Chinese and Russian militaries are investing in similar technology — so it might not be long before we see these “super-soldiers” on the battlefield.